Stainless steel computer enclosures designed specifically for harsh environments ideal for food processing and pharmaceutical companies. 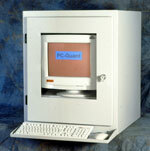 The PC-Guard computer enclosures for harsh environments are made from 316 Stainless Steel and sealed to conform to NEMA 4 and IP65 specifications. Jet wash them and your computers will be clean and safe. For More Info Please Contact PC Guard for more details. Mild steel computer enclosures designed specifically for harsh environments in outside areas. Optional stand for printer either enclosed or open. Lockable door front and back for security and easy access. When designing the computer enclosures we looked at what customers really needed and designed manufacturing cost out so that we could drive the price down, achieving a better price for you. Laser Printer enclosures are designed specifically for Printer protection in food processing and pharmaceutical companies. The PC-Guard Laser Printer enclosures are also made in a Stainless Steel form and are sealed to conform to IP54 specifications. Jet wash them and the printers will be clean and safe. Why use a Laser Printer Enclosure? Laser Printer enclosures allow the use of printers to stand along side computers in areas that need to be hosed down, so to ensure the complete area is clean. Contact us for information on other enclosure products, optional extras or specials.